The world of myth is fascinating. If in a million years’ time, aliens come down to earth, they will probably treat stuff like Harry Potter as epic poems and ordinary animals as mythical beasts. This is where a lot of myths nowadays originate from. Like when settlers came to Africa, they saw a beast with hair over its eyes (wildebeast). They called it the catoplebas, and it had hair over its eyes to protect people from its deadly gaze. That was just one. Here are more interesting mythical beasts and where they came from. Al-mi’raj– This rabbit from Islamic poetry has the horn of a unicorn. 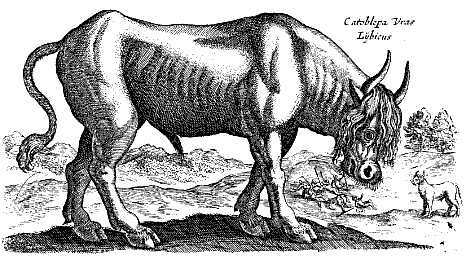 Bonnacon – This Asian bull has burning dung. Wendigo- An Algoquinan spirit which formed when someone turned into a cannibal. Akhulut- An Inuit monster that is a half-dog, half-orca. Shinigami- Japanese entitys that take souls to be judged. Chi-lin- The equivalent of a unicorn in China. Ahuizotl- A creature in Aztec belifs that mimics peoples voices. Draugr- Undead creatures from Norse mythology. Tzitzimitl- Another Aztec monster, these deitys are associated with stars. A lot of these creatures I listed are obscure creatures from their country, like the akhulut and shinigami. I found them out in books and the internet. I have always been interested in mythical beasts and their stories and I’ve read a lot about them. There are a lot more fascinating creatures. Why don’t you find them out? What are your favourite mythical creatures? Please leave a message and let me know. I learnt about Oedipus And The Riddle Of The Sphinx. The Sphinx is merciless! What do you think of her? The proper name for the myth is The Riddle of the Sphinx. However, the Sphinx is only a part of the bigger myth called Oedipus the King. Plus, the original Sphinx was the giant stone Egyptian Sphinx.